A Jaguar warrior holding a macuahuitl sword and shield. ocēlōtl "jaguar" + oquichtli "warrior"
Jaguar warrior, jaguar knight, members of the Aztec military elite donning jaguar skins. 1645, Horacio Carochi, Arte de la lengua mexicana, (4.6.1). amoyölïcàtzin mocëloquichtine, tocnïhuäne: cämpa öanhuällàquè? huel anmiequïntin: auh ca çannötitèhuän; tiquìtoà, àçomà oc azcentlamantin. welcome o jaguar warriors, our friends; where do you come from? You are very many: and you are from our nation, we understood that you were from another caste. 1949, Aztekische Schriftsprache; Grammatik mit Lautlehre, p. 170.
cf. cuiloa. oceloquichtli Jaguarmann, met. für tapferer Krieger; cf. oquichtli + ocelotl; . aber oquichocelotl = Jaguarmännchen. cf. painting. oceloquichtli Jaguar man, met. for brave warrior; cf. oquitchli + ocelotl; . 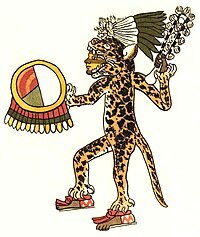 but oquichocelotl = Jaguar men. http://www.gdn.unam.mx/diccionario/consultar/palabra/oceloquichtli	Gran Diccionario Náhuatl "ocēloquichtli"